This lovely species is aptly named as pulchellum means beautiful and Osmoglossum pulchellum has both beautiful flowers and a gorgeous scent. The species is native to cool forests from Mexico to Costa Rica between 1200 and 2600m and has a fascinating habit. 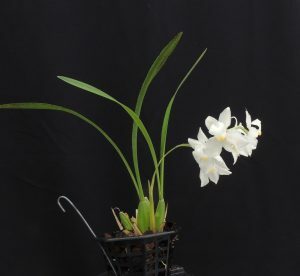 It has shiny bulbs and thin 15cm long leaves and thin flat flower stems which always curve attractively to present the non-resupinate (upside down) flowers well clear of the leaves. I have seen growers steak the spikes to force them upright which seems to loose the grace of the species. We grow Osmoglossum pulchellum amongst our masdevallias (with which it shares its habitat) in our Cool Asia section with a minimum of 12C and lots of water throughout the year. It does well in pots and baskets. I first grew this species as a boy (44 years ago) and it is a species I wouldn’t be without. It is a shame that everyone can’t smell the flowers on this webpage – put smelling Osmoglossum pulchellum on your bucket list. This orchid definitely is extremely beautiful and I will come and “smell” it in the greenhouse! I am not surprised it is one of your favorites. 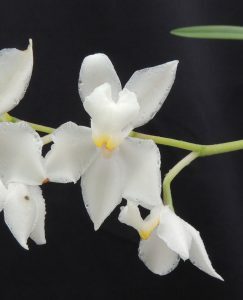 I have really enjoyed all the white and cream orchids you have written about over the last week. They look so beautifully bridal. I have loved seeing them in the greenhouse too especially all the Dendrobium specioum with their different sizes and lacy looking flowers in a variety of cream and white. Wonderful!